I'm a very proud mummy this evening! 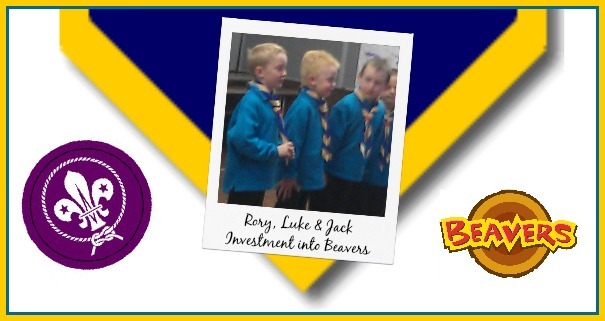 Today Jack and his friends Rory & Luke were Invested into the Beavers, making them official Beaver Scouts now. Parents were invited to stay and watch the investing at the start of this evenings meeting, and also to see some of the older Beavers "swim up" to Cubs at the end as the Cubs meeting runs straight after the Beavers meeting. It was lovely, and really interesting to see what they did at the meetings. The kids are clearly have such a great time and the leaders are really nice too. I loved seeing Jack and his friends make their Promise and receive their neckers and certificates. Although now I have a TON of sewing to do with all of his new badges! He has 4 new ones just as part of the investment! They have some great activities coming up soon, including a trip to the local fire station and a "midnight" walk. Jack is practically bursting with excitement at going each week!